Mondays aren’t for everyone, except for Let’s Talk Sport that is! Because nearly every Monday is Motorsport Monday, where I give a brief rundown of the past week’s motorsport. It’s been a rather busy weekend, with the WEC, MotoGP and BTCC all having races. 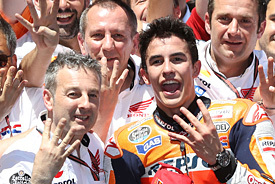 Marc Marquez has made it four in a row after winning his home GP at Jerez. The race wasn’t too hard for him after starting on pole, but Valentino Rossi did manage to pass him on the opening lap. 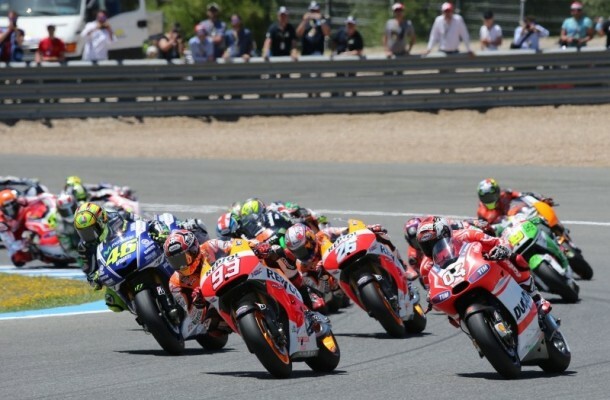 Marquez retook the lead though, and after leading by 5 seconds at some points, went on to take the win. Despite insisting that the track does not suit him. Valentino Rossi came home a good second, but it was very nearly 3rd place, after a late race charge allowed Dani Pedrosa to finish less than a 10th of a second behind the Italian. It was mostly a day to forget for Ducati, who had three of their riders crash out, and one finish outside the points. There was a small silver lining though, in the form of Andrea Dovizioso, who finished 5th. 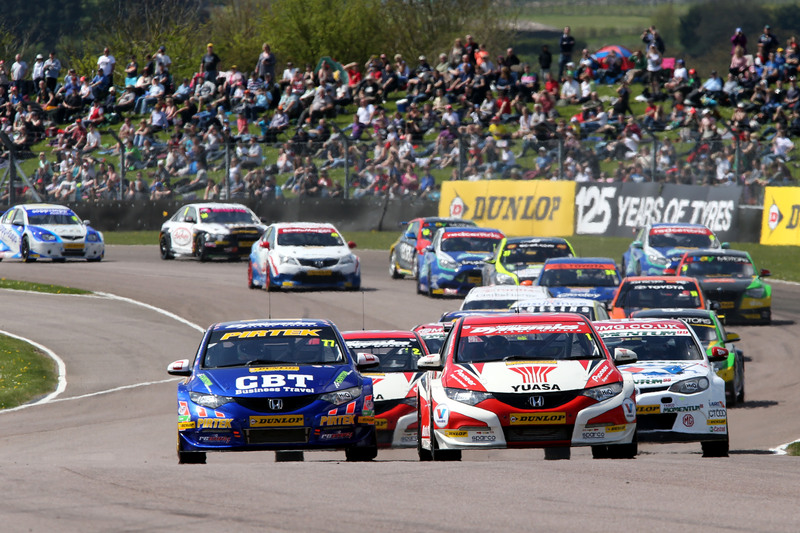 Andrew Jordan continues to lead the championship after rounds 7,8 and 9 of the British Touring Car Championship at Thruxton. The Honda Civic is well suited to a track like Thruxton, where stability is key, as almost every part of the track is a corner. In race 1 Jordan started on pole, despite carrying 36kg of success ballast. He held the lead into the first corner, but quickly came under attack from the fast starting Motorbase Ford Focus of Mat Jackson. Matt started 4th, behind the two Honda Yuasa cars, but shot into second place by the first corner. He harried Andrew’s Honda for several laps, and it looked like he would pass him at any moment. But Andrew was playing the long game, conserving his tyres. Jackson on the other hand had worn out his tyres after his assault and quickly dropped back. A mistake later on meant that the two Honda Civic Tourers of Matt Neal and Gordon Shedden sneaked past, relegating the Ford driver back to 4th. 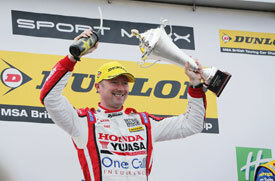 The race finished a Honda 1-2-3, with Andrew Jordan finishing ahead of Matt Neal and Gordon Shedden. The win in race 1 meant that once again Andrew Jordan was on pole, with the feisty looking Honda Yuasa cars just behind him. As the race got under way Jordan led, but Neil and Shedden teamed up to block the ever fast starting BMW of Rob Collard. Shedden was soon on the back of Andrew Jordan, who was using the same tactic of saving his tyres and hoping to outlast his opponent. All it took was a tiny mistake by Jordan and Gordon was through into the lead. The pair were still close until the race was red flagged with two laps to go. Further down the field Rob Austin made contact with the BMW of Nick Foster at Church corner. The BMW went skidding along the grass, and collided with the tyre wall. The angle at which he hit the wall caused the car to hop over it, but thankfully Nick was okay. despite the nasty looking crash the car was fixed and ready for race 3. Fabrizio Giovanardi was on pole for race 3. As per usual, driving standards were thrown out of the window for the 3rd and last race of the day, with 6 cars retiring in the end. Giovanardi led away from the start, but the BMW of Colin Turkington made its typical flying start, to go from the 3rd row on the grid to second by the end of the first lap. Colin got an excellent run on Fabrizio’s Motorbase Ford, and passed him with ease. He steadily built a gap to second place before the safety car was brought out. Ollie Jackson’s proton had gone straight on at Church, demolishing the front end. After that had been cleared up racing resumed, and Turkington built another modest gap before the safety car was brought out once again. This time the crash was more serious. Simon Belcher’s Toyota had a suspension failure on the entry to Church corner, had he went straight on. 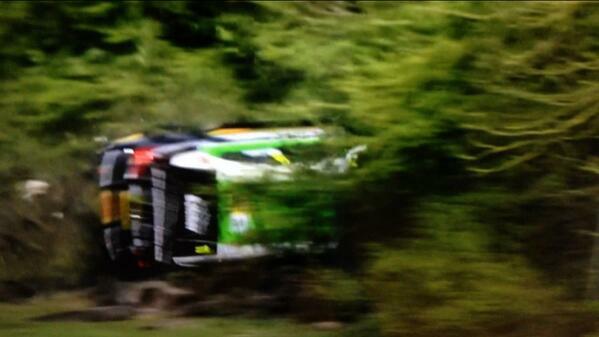 Unable to scrub off any speed he hit the tyre wall at about 120mph, spectacularly barrel rolling into the bushes. As a mighty testament to the strength of the car he emerged from the crash shaken but not stirred, giving the cameras a thumbs up in the process. Colin Turkington went on to win the race, but not without more drama behind him. At the final chicane Matt Neal made a last gasp move on Rob Collard, only to put both cars into a spin. Collard went on to finish a somewhat disgruntled 10th place. 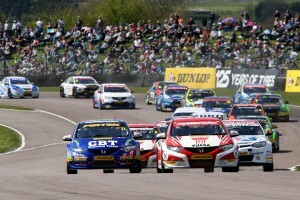 Championship contender Jason Plato had a quiet weekend, culminating in his retirement in race 3. The Mercedes of Adam Morgan got knocked into a spin by Rob Collard, and as he corrected the car, he slammed into the side of Jason Plato, destroying the rear suspension. 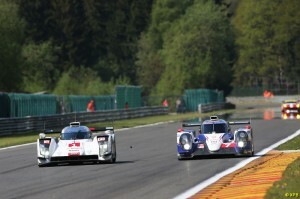 Toyota have made it 2 for 2 at round 2 of the World Endurance Championship on Saturday, with the 6 Hours of Spa. Porsche claimed their first pole position since their return, and looked to be in control for the first 2 hours. When it came time to pit the Porsche took on tyres and fuel whereas the Toyota only took on fuel. 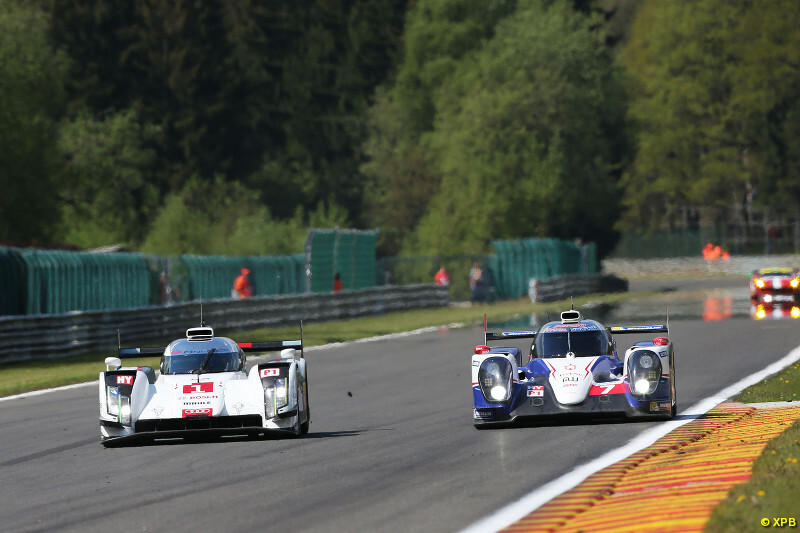 This turned out to be the better strategy, and the Toyota took the lead in the second hour. Porsche never had the opportunity to mount a comeback, after both cars suffered reliability issues. The number 14 car which had lead the race developed an electrical fault, which took 2 laps to sort out. The number 20 car on the other hand damaged the suspension on one of the kerbs, and spent the rest of the race frequenting the pits for repairs. Audi looked to be well off the pace at the start of the race, being around 30kph slower than the Toyota on the straights. But the cars came good in the end, with one of their cars finishing a surprise 2nd place. The second Toyota rounded off the podium, making it a Toyota 1-3, and putting them firm favourites to win the 24 Hours of Le Mans next month. The start of the 2014 DTM season at Hockenheim was dominated by BMW driver Marco Wittmann. Adrien Tambay, son of former F1 driver Patrick Tambay, put his car on pole, and initially led the race, before being barged out of the way by Wittmann. Marco went on to control the race, and eventually won by 12 seconds. Swede Mattias Ekstrom finished second in his Audi, with polesitter Tambay third. Toro Rosso reject Antonio Felix da Costa looked good for a solid points finish, that was until he crashed into Timo Schneider 9 laps from the end. Whilst the race was good for both BMW and Audi, Mercedes were nowhere. DTM returnee and former champion of the series Paul Di Resta finished a lowly 14th, and fellow F1 reject Vitaly Petrov finished 17th.